A raid on an illegal dance bar in the heart of the Goa capital has triggered outrage amongst the opposition parties in the state. The Congress and Nationalist Congress Party (NCP) have criticised the Bharatiya Janata Party (BJP) and Chief Minister Manohar Parrikar, in whose constituency they say dance bars are taking root. 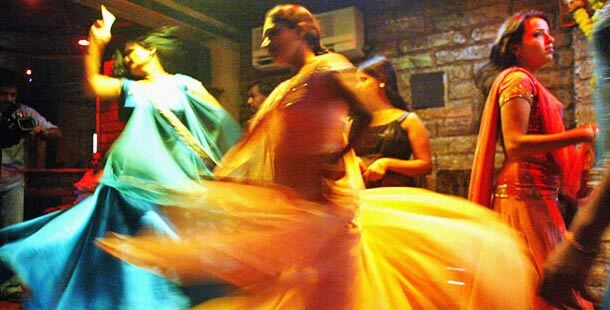 A senior cabinet minister said the government would crack down on the dance bar phenomenon in Goa. "Imagine a dance bar functioning right in the middle of Panaji, the capital and the chief minister's constituency. And that too after Parrikar on August 15 in his public speech announced that no dance bars would be allowed in the state," said NCP spokesperson Trajano D'Mello. A police raid in a city hotel Tuesday, following an anonymous phone call, resulted in the rescue of six women and the arrest of six men, including a Samajwadi Party legislator from Uttar Pradesh. Police said there were also two other Samajwadi party leaders from Uttar Pradesh - Jaipratap Singh and Dharmendra Pratap. According to Panaji police, the six girls rescued were brought from New Delhi and Mumbai. A police officer who was part of the raid said all the accused men were sitting on mattresses on the floor and the girls were dancing to Bollywood songs in the centre of the room. "It was clearly a 'mujra' which was happening there, with the girls dancing and the accused people sitting with wads of money and alcohol," police said. Police are now probing whether the girls were also procured for prostitution. Congress spokesperson Agnelo Fernandes said the existence of a dance bar in the capital showed the double standards of the BJP, which has been trying to "cleanse" the coastal belt of illegal dance bars and discos. "If this is the state of the capital, I cannot even think what happens along the beach belt, with the law and order situation already so bad," Fernandes said. While Goa is home to trance music and open air parties, the phenomenon of dance bars which were synonymous with Mumbai is relatively new. Earlier this month, the BJP leadership opened a can of worms after its vice president Wilfred Mesquita gave a thumbs-up to dance bars. "If alcohol which is the worst, is allowed to flow in the gutters of Goa, I can't see why you have a problem against it (dance bars)," Mesquita said Aug 9. His statement came a few days after the Supreme Court lifted the ban on dance bars in Maharashtra. Reacting to the raid, Tourism Minister Dilip Parulekar came to the defence of the chief minister and the BJP, and claimed the government would break the backs of dance bars in the state. "The government is firm. Even if the Supreme Court has no objection to dance bars, the Goa government will remain firm. We will break down all dance bars," Parulekar said.